"Bring the art and beauty of Japan to your garden with inspiration from Kyoto Gardens." Featuring beautiful Japanese garden photography and insightful writing, Kyoto Gardens is a labor of love from master photographer Ben Simmons and Kyoto-based writer Judith Clancy. In their rocks and plants, empty spaces and intimate details--Kyoto's gardens manifest a unique ability to provoke thought and delight in equal measure. These varied landscapes meld the sensuality of nature with the disciplines of cosmology, poetry and meditation. Japanese aristocrats created these gardens to display not just wealth and power, but cultural sensitivity and an appreciation for transcendent beauty. A class of professional gardeners eventually emerged, transforming Japanese landscape design into a formalized art. Today, Kyoto's gardens display an enormous range of forms--from rock gardens display of extreme minimalism and subtle hues, to stroll gardens of luscious proportions and vibrant colors. 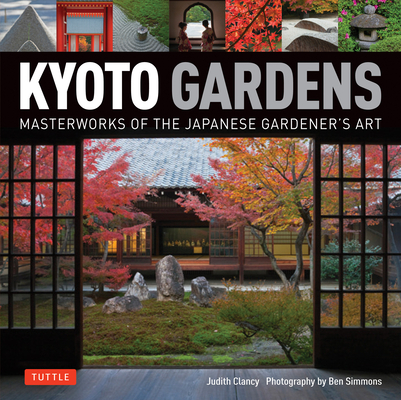 In Kyoto Gardens Simmons' photographs present a fresh and contemporary look at Kyoto's most important gardens. Their beauty is enhanced and humanized by gardeners tending the grounds using the tools of their art. Clancy's graceful text provides historical, aesthetic and cultural context to the Japanese gardens. Combining wonder and rigor, she describes how Kyoto's most beloved gardens remain faithful to their founders' creative spirit and conception. Journey to Kyoto's thirty gardens with just a turn of a page, or use the handy maps to plan your trip. Judith Clancy has lived in Kyoto for more than 40 years, writing and teaching about Japanese culture. Her first publication, Naturescapes, was a tribute to her Ikebana teacher, Tamura Suiko, who, through the art of flower arrangement, instilled a deep and subtle appreciation of Japanese aesthetics and character. Exploring Kyoto: On Foot in the Ancient Capital went beyond the usual guidebook. Its 30 detailed walks through Kyoto reveal temples, shrines and folklore to visitors while taking them on a journey through centuries of Japan's traditional architecture and culture. Kyoto Machiya Restaurant Guide relays the culinary delights within Kyoto's renovated townhouses, and in Kyoto: City of Zen, Clancy and Simmons introduce viewers to Japan's ancient capital. Clancy lives in a 120-year-old converted weaving studio in Nishijin, the weaving and dyeing district of Kyoto. Visit her website at kyotoworkshops.com. Ben Simmons is a longtime Japan resident whose photos have appeared in books, magazines, and exhibitions worldwide, including the Victoria and Albert Museum and the United Nations. He holds an MFA from the University of Florida. Some of his other book projects are Tokyo Megacity and Traditional Japanese Architecture: An Exploration of Elements and Forms, both published by Tuttle.